BINONDO, A Tsinoy Musical’ tells the story of how LILY, a Filipina nightclub singer in pre-Martial Law Manila, and AH TIONG, a mainland Chinese scholar returning to Cultural Revolution-era Beijing, embark on a journey of great love and heartbreak that begins one fated, moon-lit night during the Mid-Autumn Festival of 1972 in the heart of Manila’s Chinatown. Spanning two decades (the 1970s and 1990s respectively) and two countries (China and Philippines), the musical explores how love can triumph amidst racial prejudice and political turmoil, years of waiting and absence; only to grow deeper and change the lives of everyone who dares to put their hearts on the line. Presented by Synergy 88 Digital and Rebecca Chuaunsu Film Production. Ryan Caraan, Carlos Deriada Jr., Rence Aviles, Paul Clark, Xander Pineda, Romcel Brinquis, Joseph Puducay, VJ Cortel, Daniel Cruz, Zyrus Imperial, Cheeno Macaraig, Roy Sotero, Dusty Suarez, Randy Rey, Precious Sementilla, Julia Chua, Janine Tolentino. Dr. Rebecca Shangkuan Chuaunsu obtained her masteral degree in Speech Communication and Theater Arts and her doctorate degree in Communications. She garnered both degrees from the University of the Philippines. She has acted in multi-roles in theater (The Joy Luck Club), television (Be My Lady, A Love to Last, Asintado, Tadhana, Wagas, etc.) films (Mano Po 7 Chinoy) audiovisual presentations(SM, Smart, Globe, Maxicare, health, insurance and real estate products) and TV commercial (Oatmeal). She won a Best-supporting actress award at the Mapua Institute of Technology and was nominated as one of the best producers for Bayan Bayanan. She is President and CEO of Rebecca Chuaunsu Film Production. She supplies talents for television, films, AVP and TVC. Binondo is her 1st foray as a creative/line producer in Musical Theatre. 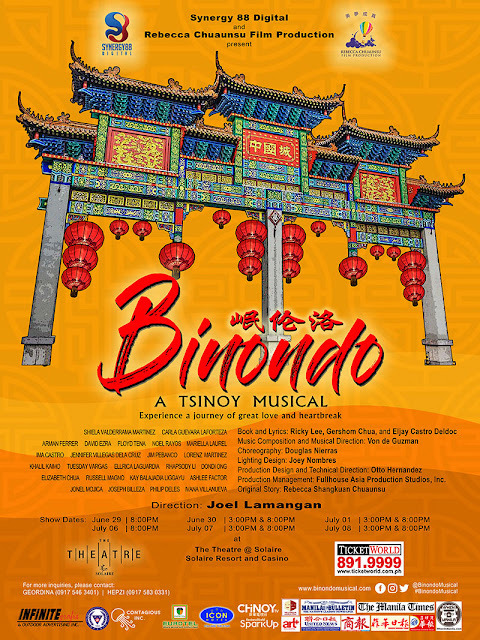 The Binondo Musical is produced in partnership with Synergy 88 Digital, a digital solutions company and art studio that fuses creativity and technology to create cutting-edge digital solutions. The producers of Binondo, A Tsinoy Musical are working with Fullhouse Asia Production Studios, Inc. , a boutique production company that offers highly specialized services in talent management & cross-platform execution for film, tvc & live events. Mr. Joel Lamangan, DGPI is a film and television director and actor. He rose to fame in the early 1990s as a dramatic filmmaker and has since directed multiple award-winning films. In 2015, he was conferred with the highest honor to the rank of Legion of Honor of the Order of DeMolay from Baja Chapter for outstanding leadership in his field of endeavor, for service to humanity, for success in fraternal life, including adult service to the Order of DeMolay. He also won as Best Director in the METRO MANILA FILM FESTIVAL for the films Muling Umawit ang Puso, Mano po 1 and 6 in 1995, 2002, and 2009, respectively. Mr. Ricky Lee is a screenwriter, journalist, novelist, and playwright. He has written more than 150 film screenplays since 1973, earning him more than 50 trophies from various awardgiving bodies, including a 2003 Natatanging Gawad Urian Lifetime Achievement Award from the Manunuri ng Pelikulang Pilipino (Filipino Film Critics). As a screenwriter, he has worked with many Filipino film directors, most notably with Lino Brocka and Ishmael Bernal. Many of his films have been screened in the international film festival circuit in Cannes, Toronto, Berlin, among others. For Binondo, A Tsinoy Musical, he is working along with Gershom Chua and Eljay Castro Deldoc. VON DE GUZMAN holds a Bachelor of Music degree in Composition from the University of the Philippines and a Master of Fine Arts degree in Musical Theatre Writing from the Tisch School of the Arts at New York University. He is a composer, arranger, and music director for film, television, theater, and advertising. His film scores for full-length motion pictures have won awards in the Metro Manila Film Festival, Gawad Sining Sine Awards, Golden Screen Awards, Gawad Genio Awards, Film Academy of the Philippines Luna Awards, PMPC Star Awards, and the Filipino Academy of Movie Arts and Sciences Awards (FAMAS). He has composed a number of musical theater pieces such as “Sherwood” “The Elixir” and “The Wallowhat and the Pinchay” (book and lyrics by Tim Nevits), which was presented in an off-Broadway performance in 1999. DOUGLAS NIERRAS is the founder, Artistic Director and Choreographer of Douglas Nierras Powerdance. He is the NCCA “1998 PASASALAMAT NG BAYAN SA SAYAW” awardee for Modern Dance and recipient of the “GAWAD ALAB NG HARAYA 2001” award for Outstanding Choreography in Dance. Nierras was also the Grand Prix Winner at the 10th SAITAMA INTERNATIONAL CREATIVE DANCE CONCOURSE 1999-2000, the first and only international Grand Prix honor for creative Contemporary choreography won by a Filipino in his entire dance history.He was also dubbed by noted art critic, Marge Enriquez as “one of the country’s most important choreographers of the century”, and “The Quintessential Choreographer” by National Artist for dance LEONOR OROSA GOQUINCO.